The fliers, found near Lee Avenue and Rodney Street, were reported to police Thursday night. WILLIAMSBURG — A man on a motorcycle tossed fliers filled with swastikas and anti-Semitic drawings on the street in the heart of Williamsburg's Orthodox Jewish community, the NYPD said. The biker, who was wearing a black helmet at the time, was spotted dropping the fliers as he drove near the intersection of Lee Avenue and Rodney Street on Thursday around 9:30 p.m., police said. 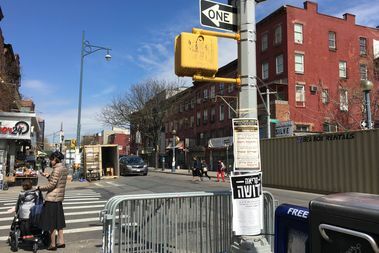 It featured cartoons with multiple anti-Semitic statements, as well a reference to the "Holocaust myth," according to an image circulating among members of the Orthodox community Friday morning and later posted on Twitter, alongside a request to call Williamsburg's Shomrim Security Patrol with any information. An NYPD spokeswoman confirmed the flier posted online was same one they were investigating. A person who answered the Shomrim's emergency line declined to comment. "It's bad. This is the middle of Williamsburg, this is the heart of the community," said Moses Bondo, 55, owner of Lee Rodney Food Center at the corner of Lee Avenue and Rodney Street, who witnessed the commotion Thursday night when police arrived at the scene. "It shows a lot of hate," he said. It wasn't immediately clear if the NYPD's Hate Crime Task Force was investigating the incident.